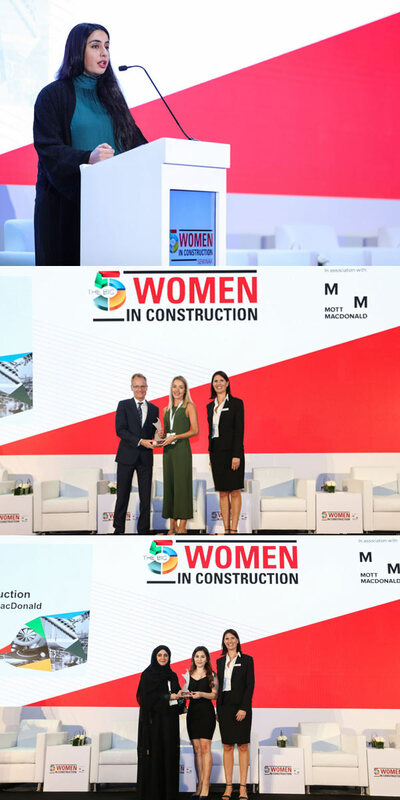 The first Women in Construction Seminar & Awards was launched today (November 28) at the Dubai World Trade Centre, as part of The Big 5, the Middle East’s largest construction event . Organised in association with Mott MacDonald, the seminar addressed the challenges that women face in terms of equal opportunities in construction, a traditionally male dominated sector. Anwaar Al Shimmari, Chief Innovation Officer at the UAE Ministry of Infrastructure Development, Cynthia Corby, Audit Partner & Middle East Construction Industry Leader at Deloitte & Touche Middle East, Hind Alowais, Vice President International Participants at Expo 2020, and Dr Shetha Al Zubaidi, CEO Alfahim Avenue Group Companies - Brookson Project Management, were among the many high profile speakers at the event. In her opening remarks, Josine Heijmans, the portfolio director at dmg events, said: "As we pursue our mission to support and move the building industry forward, we recognise that developing the construction sector also means developing its workforce." "With The Big 5’s Women in Construction Seminar & Awards, not only we are putting women empowerment and gender parity in construction on top of the agenda. We are also shedding light on some of the great women who are changing the game and making an impact in the construction sector," she stated. A panel of experts awarded Jovana Lukac, Structural Engineer at Robert Bird Group, and Suheir Islam, Geotechnical Engineer at SNC-Lavalin’s Atkins, as Next-Generation Woman of the Year 2018. Suad Khawaja, Dubai Area Manager at Parsons, was awarded Woman in Leadership of the Year, in light of her outstanding achievements and leadership skills and positive impact on the industry. Shorouq Hamawi, the regional communications and marketing manager at Mott Macdonald, and one of the speakers at the Women in Construction Seminar, said: "Continuing from the UAE’s leadership vison and its approach to women’s empowerment, we believe this is a great opportunity to showcase our commitment to support and value women in construction." "Traditionally, women have faced challenges related to pay gap, career development, promotion opportunities and leadership appointments," she noted.